My son's personal collection of hockey sticks. 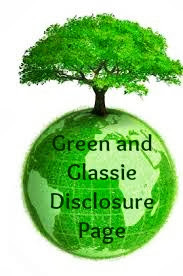 You've probably noticed that green is everywhere these days -- in the news, politics, fashion and even technology. Well now you can add hockey to that list. Reduce your carbon “stick” print and join Total Hockey’s Green Initiative by recycling your broken and unusable composite hockey sticks. Twenty five years ago hockey sticks were made from wood and wore out, and aluminum sticks would bend or crack. The problem with the 3.2 million composite sticks produced worldwide is that they are bound to wind up in a landfill. 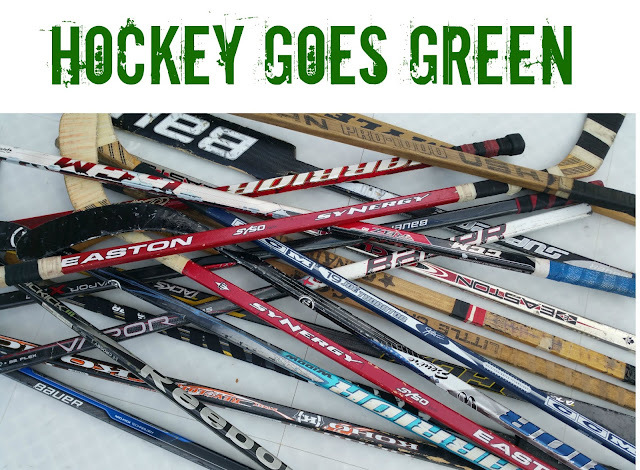 Hockey Green hopes to slow the number of newer sticks going into landfills by offering a $10 credit towards a new stick when you turn in your old stick. Hockey is about scoring goals. Hockey Green's goal for this initiative is to build a large inventory of carbon fiber materials that can be used by scientists so they can develop a method to reuse these materials in the creation of new products. Composite materials are known for their durability, high strength, excellent quality and low weight, but what were faced with is the need to recycle composite materials and no identifiable process for doing so. Composite is widely used in automotive, construction, aerospace and renewable energy industries because of the edge it provides over traditional materials. Fortunately, R&D activities are on the rise to finding solutions on how best to recycle and dispose of composite materials. HOW TO RECYCLE YOUR STICK! Take broken composite stick to a Total Hockey retail store. If stick meets qualifying eligibility requirements, you will receive a $10 credit towards a new stick purchase. If you do not have a stick with you at the time of your purchase you have 90 days to bring in an eligible stick to receive the $10 credit. All new stick purchases made online will include a Hockey Green bag providing players an easy way to return their unwanted sticks to Total Hockey recycling process center. Place the FREE UPS Return Ship label on the package and drop off at a UPS store or drop box. Let's all share the same goal and help reduce our carbon footprint! For more information visit...Hockey Green. For post about Hockey ~ Lake Life ~ Cats ~ Flawless Finds check out Wildly Aware. I love this. I think it's so important for all of us to reduce our carbon footprint. What a great program. I love that there are so many ways to be a little more "green", even when it comes to sports. I never really thought about recycling hockey sticks! Great idea for being green in all areas of your life. This is so cool! So thoughtful. My best friends are a big hockey family (hockey life!) and they'd love to see this. I think they go through many sticks with a family of four. I think it's great that hockey is going green. I recycle everything that I can and try to teach my grand kids too as well. I'll pass this info along. My kids have never played hockey so we've never had to deal with this but good to know that there is a way to dispose of your used hockey stick safely. My kids don't play hockey either so we have never had to think about how to dispose a used hockey stick. Love that hockey is going green! That is really neat. Cool the can recycle. This is an awesome green initiative for hockey fans. Most people throwing out old sticks are probably seeking new ones anyway! I am liking this. I think it's so important for all of us to reduce our carbon footprint. I just love that the Be Green movement has even made it's way to hockey sticks! This is really good info to know and I will be sharing it with my Hockey Mom friends! My kids don't play hockey, so I never would have known this about the sticks. This is a great initiative. I almost forgot hockey is a sport Americans like lol. It great that hockey is going green more sports should! We live in the area of the famous Wilkes-Barre/Scranton Penguins and hockey is big around here. I have never been to a game but it's great to see sports going green! What a great idea. My husband played hokey from his childhood through college. He still has some of his hockey sticks from these times. Awesome information! My nephew plays hockey and so does my son's best friend. I'll be sharing! I love this! SO cool! It's so important for us to reduce our carbon footprint everywhere! Even in hockey!